Sensitive Skin features art, writing and music, without rules or boundaries, by both famous and emerging artists, writers, and musicians from around the globe. We started getting some attention – outside of the Lower East Side, that is – with this issue, as we were joined by not one but two beat generation giants, Herbert Huncke (Guilty of Everything) and Jack Micheline (sixty-seven poems for downtrodden saints), not to mention top-notch contemporary novelists Joel Rose (Kill the Poor), Carl Watson (Backwards the Drowned Go Dreaming) and future editor Rob Hardin (Distorture) as well as poets Lester Afflick, Stephen Paul Miller, Eve Packer and another future editor, poet, publisher and Unbearables co-founder Ron Kolm (The Plastic Factory). Writing by Joel Rose, Dr. Snakeskin (Darius James), Herbert Huncke, Jack Micheline, Christian Haye, Edward K. Brown, Hilda Daniel, John Farris, Bob Holman, Patricia Winter, B. Kold, Carl Watson, Rob Hardin, Jenny Seymore, “R” (Ann Marlowe), Suzanne Webber, Norman Douglas, Lester Afflick, Stephen Paul Miller, Eve Packer, Ron Kolm. Art by Fly, David Sandlin, Sebastian Schroeder, Tom McGlynn. 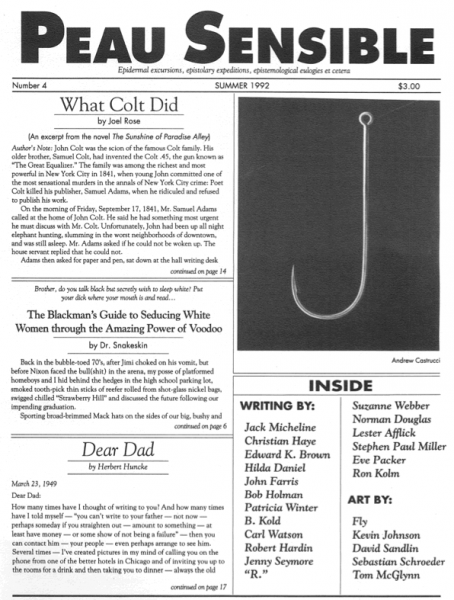 Summer 1992, 20 pages, 8.5″ x 11″, black and white, PDF format. Sensitive Skin began as a print venture from New York’s Lower East Side in the 1990s, and published such literary luminaries as Richard Hell, Steve Cannon, Jack Micheline, Penny Arcade, John Farris, Eileen Myles, Lynne Tillman, Patrick McGrath, Bob Holman, Maggie Estep, Emily XYZ, Herbert Huncke and Joel Rose, with art by Andres Serrano, Ari Marcopolis, Andrew Castrucci and James Romberger, to name but a few…. Sensitive Skin was reborn in the summer of 2010, and has since presented original work by such esteemed writers, artists and musicians as Samuel R. Delaney, John Lurie, Gary Indiana, Sharon Mesmer, Charles Gatewood, Gretchen Faust, Alex Katz, Peter Blauner, Hal Sirowitz, Arthur Nersesian, Maggie Estep, Fred Frith, Evelyn Bencicova, Thurston Moore, Iggy Pop, Winston Smith, Sue Rynski, Steve Dalachinsky, Marty Thau, Justine Frischmann, Craig Clevenger, Darius James, Stewart Home, Michael A. Gonzales, Drew Hubner, Jonathan Shaw, Melissa Febos, Stephen Lack, Max Blagg, Patricia Eakins, Díre McCain, Rob Roberge, Kurt Wolf, Erika Schickel, John S. Hall, Kevin Rafferty, Elliott Sharp, Mike Hudson, James Greer, Ruby Ray, William S. Burroughs and Allen Ginsberg.